Posted by The Way to Akhirah , 03:10:00 Be the first to comment! !!!!!!!!!!! Prior to entering Salaat, the person is required to undertake a certain purification procedure known as "Wudhu" without which, the person's prayer would not be acceptable in the sight of Allah (subhanahu wa ta'ala). Allah,-the Almighty, says:“ O ye who believe, when ye prepare for prayer, wash your faces and your arms to the elbows,- rub your heads (with water),- and (wash) your feet to the ankles” (Qur'an 5:6). 1. Acceptance of the Islamic Faith. 3. Intention (Anniyah) to perform Wudhu as an act of worship. 5. Ensuring the purity of the water to be used for the Wudhu. 6. Ensuring that water is not prevented from reaching the parts of the body which need to be washed in the performance of the Wudhu. 7. Being conscious and keeping the Wudhu in mind. 1. Washing the entire face once with Rinsing the mouth with water and Sniffing of water in and out of the nostrils. 2. Washing each arm once. 3. Wiping the entire head once and passing of water outside and inside of the earlobes. 4. Washing the feet up to the ankles. 5. Ensuring that the above 4 acts are performed in the given sequence. 1. Invoking Allah (subhanahu wa ta'ala) at the start of the Wudhu. 2. Washing of both hands up to the wrists. should be kept in mind during the Wudhu. water reach between the fingers. Miswak, the Prophet (peace be upon him) said:“ If it had not been too great a burden on my Ummah, I would have ordered them to use the Miswak at every Wudhu” (Reported by Imam Malik). 5. Cleaning the nostrils by sniffing water in and out three times. 6. Washing the entire face thrice using both hands from the top of the forehead down to the bottom of the chin and from ear to ear. 7. Washing the arms three times up to the upper end of the elbows: right arm first, and then, left arm. Arms should be rubbed while they are being washed. forehead down to the nape (the back of the neck) and from there, returning both hands up to above the forehead. 9. From the head, without wetting the hands again, the person wipes the earlobes, using the fore fingers to wipe the inner part of the lobes and the thumbs for the outside part. 10. Washing both feet up to the ankles three times, beginning with the right foot and then with the left foot. Both feet should be rubbed while they are being washed and water should freely pass between the toes. removed even from underneath his nails” (Reported by Imam Muslim). Allah and that Muhammad is His servant and messenger... O Lord, make me among those who return to you in repentance and of those who are undefiled. Regarding the virtue of the above supplication, the leader of the faithful, Umar lbn-ul Khattab (may Allah be pleased with him) reported the Prophet (peace be upon him) as saying:“ If anyone performs the Wudhu completely and then says, I testify that there is no god but Allah alone, He has no partner: and I testify that Muhammad is His servant and messenger, the eight gates of Paradise will be opened for him and may enter by whichever of the gates he wishes” (Related by Imam Muslim). anyone of you who wishes to increase his brightness may do so (by washing beyond the required areas when performing Wudhu)” (Reported by lmams Bukhari and Muslim). 4. The person is required to avoid use of water more than what is necessary. 5. Much importance has been attached to the performance of two rakaats after performing Wudhu as can be noted from the following conversation between the Prophet (peace be upon him) and Bilal, the first Muadhin (may Allah be pleased with him):“ O Bilal! tell me which of your acts is most meritorious since joining Islam, for I heard the sound of your shoes in Paradise ahead of me? Bilal replied: I do not have any action more meritorious than that whenever I performed Wudhu (purification) during the day or night, each time I offered a prayer as much as Allah has destined for me” (Reported by Imams Bukhari and Muslim). 1. 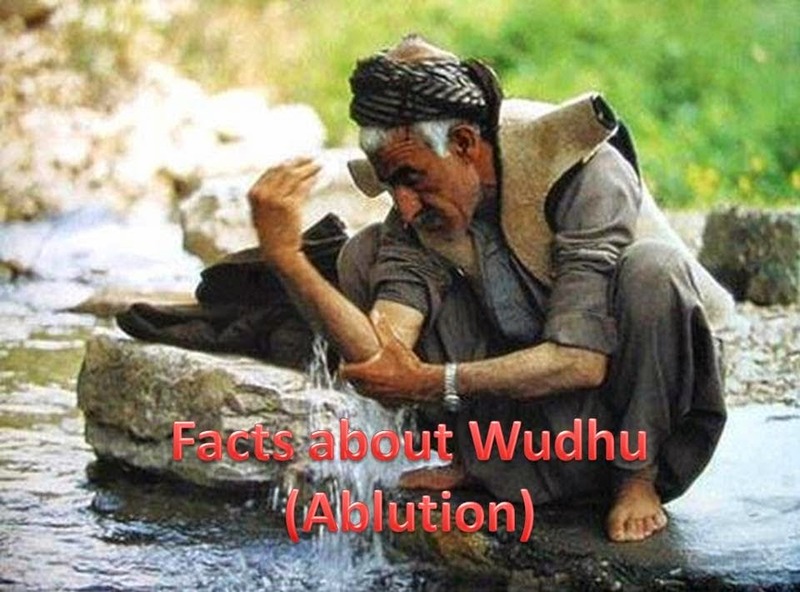 If someone's "Wudhu", gets nullified, then, when performing a subsequent Wudhu, it is allowed to wipe over the socks with wet hands, instead of washing both feet on condition that the socks were put on after washing the feet in the first Wudhu or before the same is nullified. and nights (72 hours), but a resident may do so for only one day and one night continuously (24 hours). !!!!!!!!!!! Wiping is done according to the tradition of the Prophet (peace be upon him), as follows: After removing the shoes, wet hands are passed only over the upper surface of socks without the need to wipe the bottom parts. 1. When the maximum timings allowed as discussed earlier lapse. 2. The moment the socks are removed. 3. When any of the cases requiring "Ghusl" occur. 1. Passing of excrement, urine or wind. When someone passes urine and/or excrement, it becomes mandatory upon such a person to remove the foulness of these things before performing Wudhu. Pure water should be used for this purpose, but in case, it is not available after earnest search for it, the person may resort to the use of certain dry objects, such as stones, dry woods and tissue paper to remove the filth. This is known as "Istijmaar". Odd numbers of the object to be used is preferred, such as 3, 5, etc. The person should ensure that no drops of urine or stains of foulness are left on his/her body or clothes. However, in the case of persons afflicted with permanent wetting or permanent passing of wind, or of women who are suffering from prolonged flows of blood, such persons are required to perform Wudhu only once before the start of each prayer and their Wudhu would remain valid even if the above problems may occur later in the course of the prayer. 2. Eating of camel's meat. 3. Sleeping in which the person losses consciousness. 4. Loss of consciousness resulting from insanity, fainting, etc. 5. Touching of the sexual organs intentionally, directly and unclothed. 6. Renouncing of Islamic Faith. The scientific miracles of Islam "FIRE UNDER THE SEA "
Did Mohamed (pbuh) Make Up Quran?